Thanksgiving allows us the chance to spend quality time with our elderly loved ones and share in this American tradition. It’s an exciting time to catch up with family members and enjoy delicious food. While it’s usually fun and just as entertaining for your aging parents or loved ones, it can also be overwhelming and a big shock to their normal routine. Include older relatives in the preparation and festivities once the party has begun. They may not be able to do everything they once could, but set up a chair in the kitchen and have them help out with the cooking or prior to your event have them help you with decorations. 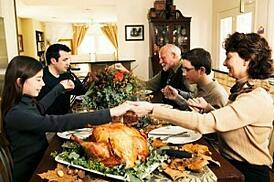 They want to be a part of this day and it will help remind them of all the happy Thanksgivings in their past. Try and keep some of their daily rituals intact. Make sure they take their medications at the same time as usual and be aware that big changes in their daily routine can be confusing. Be sure the house where the party is being held is free from hazards and obstacles so that there is no chance your older relatives could trip and hurt themselves. Consider how busy you will be at your party. If you won’t have time to ensure your parent or elderly loved one is being cared for properly, consider bringing alone his or her in-home caregiver to the event. In the end, the holidays are a time of happiness and joy and you want your family members – young and old – to enjoy this time of the year. Focus on what you do have and the positives in your life!